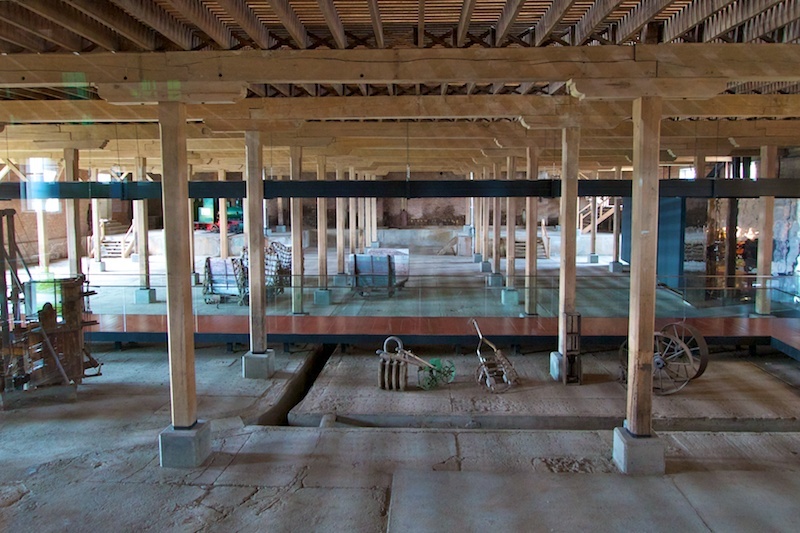 A modern day steampunk fantasy has been resurrected from the industrial bones of an early 20th century cold storage plant in Southern Chile. In this historical space, Singular Hotels now offers a 5-star luxury hotel and spa experience like no other. 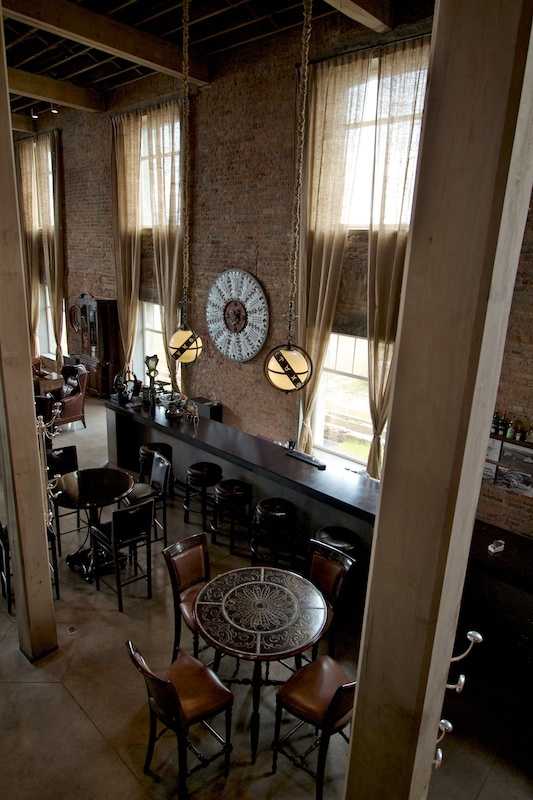 The hotel is visually unique with its immense brick wall architecture, vertical columns supporting high ceilings and large windows that draw in every bit of sunlight. 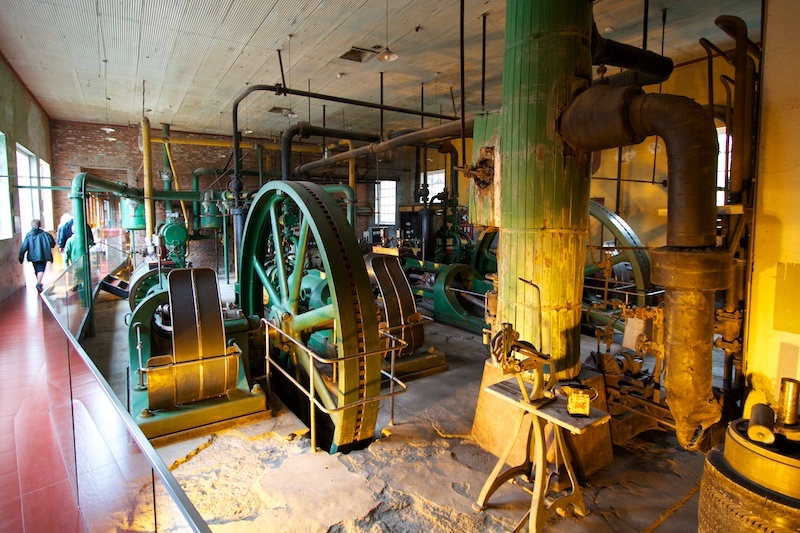 Giant flywheels attached to huge pistons sit next to a complex series of valves that once regulated the flow of Ammonia. 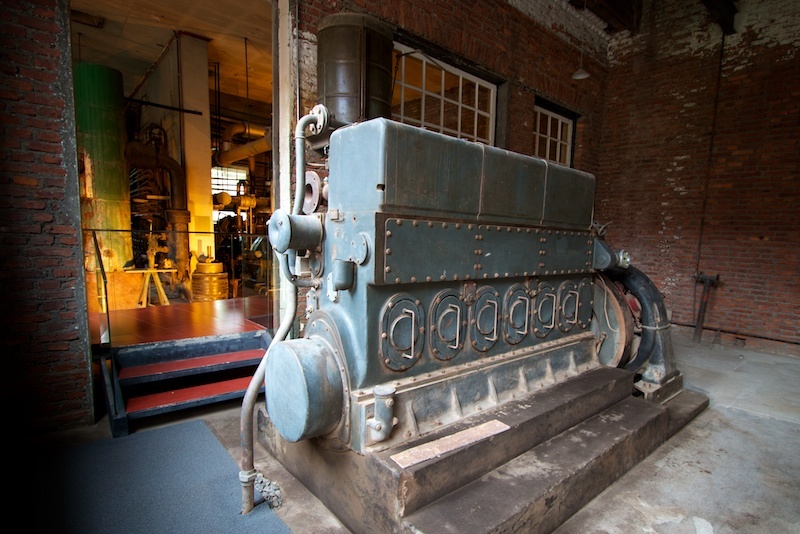 Electrical generators that bellowed around-the-clock to feed the industrial heart of the plant are also on display. Luxury rooms and spa facilities are all new construction while the rest of the hotel resides within the original brick walls of the plant. 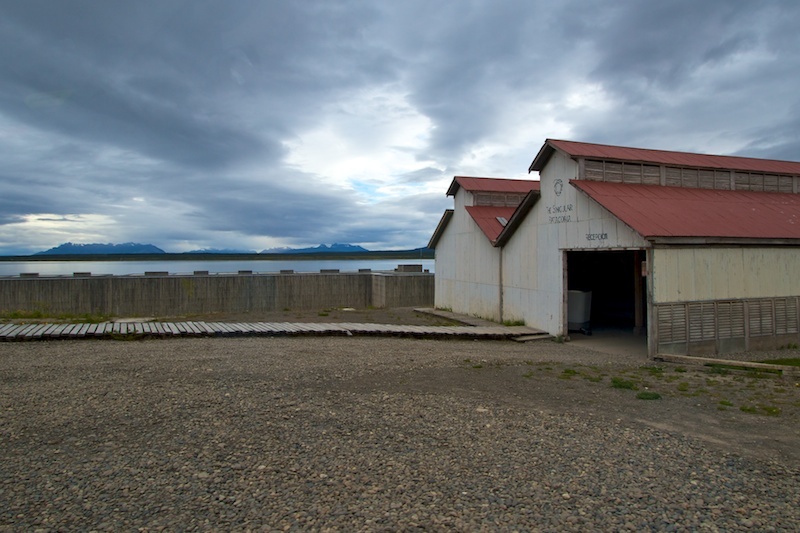 On the shore of Last Hope Sound, which connects western Patagonia to the Pacific Ocean, this industrial landmark was named a National Historic Monument in 1996. 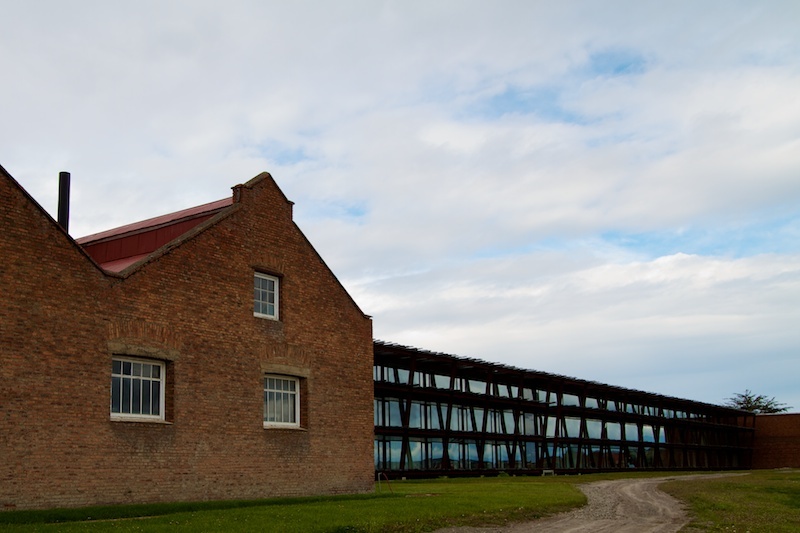 Long abandoned, 4th generation descendants of the original founders began a plan of restoration and reuse of the complex in 1998. 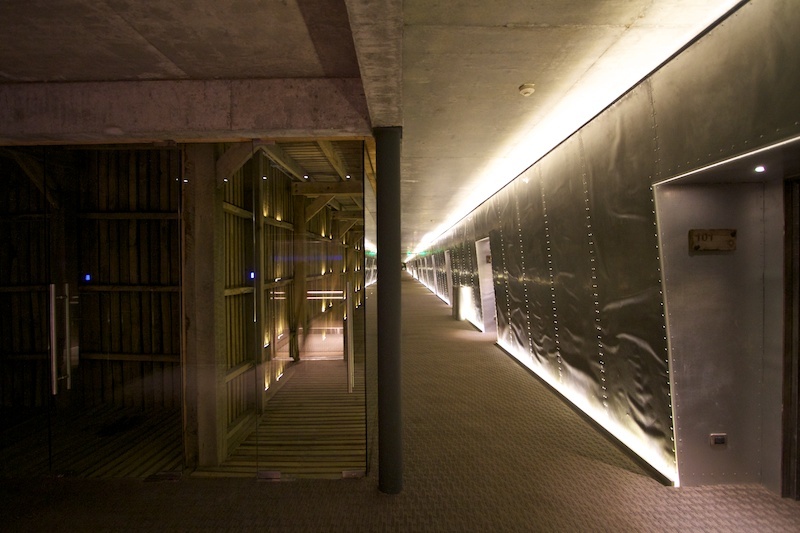 Working with local architect Pedro Kovacic B, who preserved the site’s industrial, post-Victorian feel, the Singular Patagonia hotel opened its doors in 2010. Visitors arrive at the property and enter a large storage shed that offers drive-in shelter from the weather. At the end of the shed, comfortably enclosed in glass walls, is Reception. While registering for your stay, you’ll be treated to dark or white chocolate confections that will make you wish they were less efficient so you could linger by the treats a bit longer. 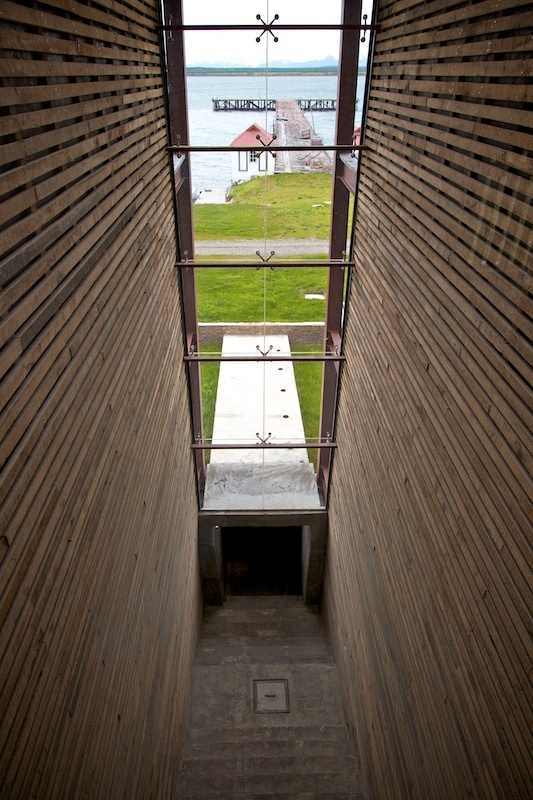 You can choose to walk down the exterior steps or ride the operating funicular that slowly moves you down the hillside to the main part of the complex. 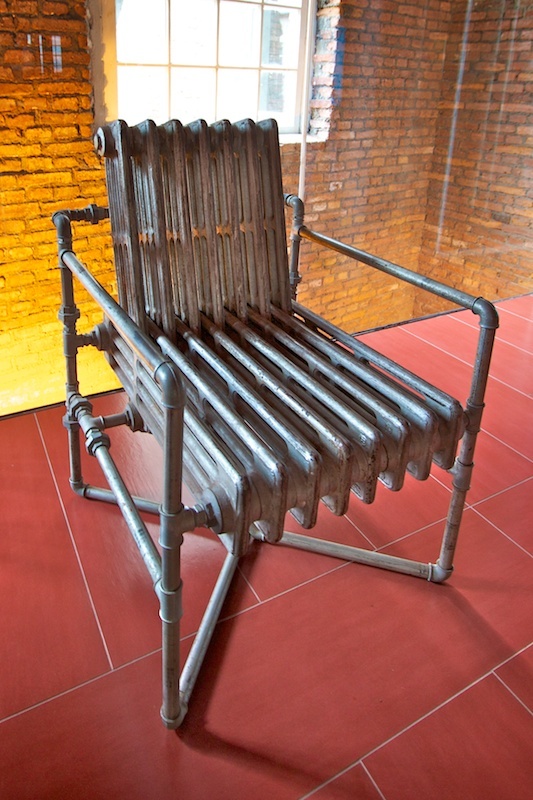 Leaving the front desk area with its whimsical chairs made of old radiators, a long hallway leads to the guest rooms. This hallway showcases much of the machinery imported from England over one hundred years ago. 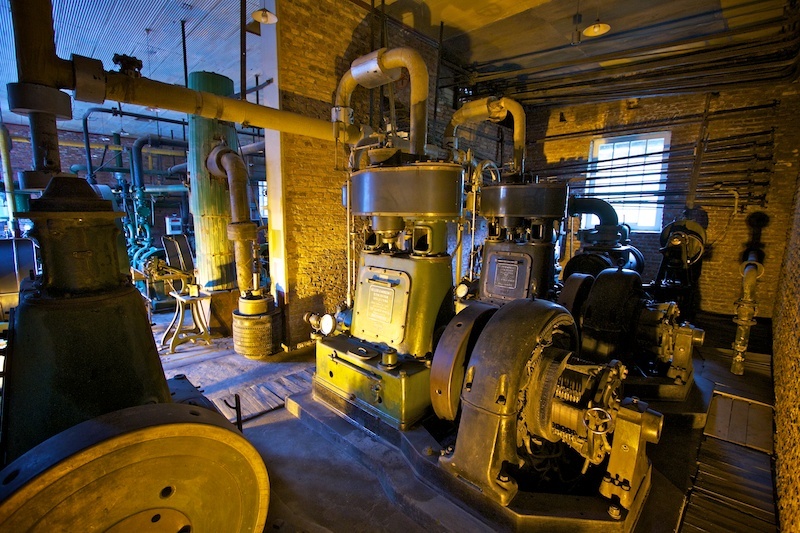 The massive boilers that generated steam for refrigeration and electricity are on display here. 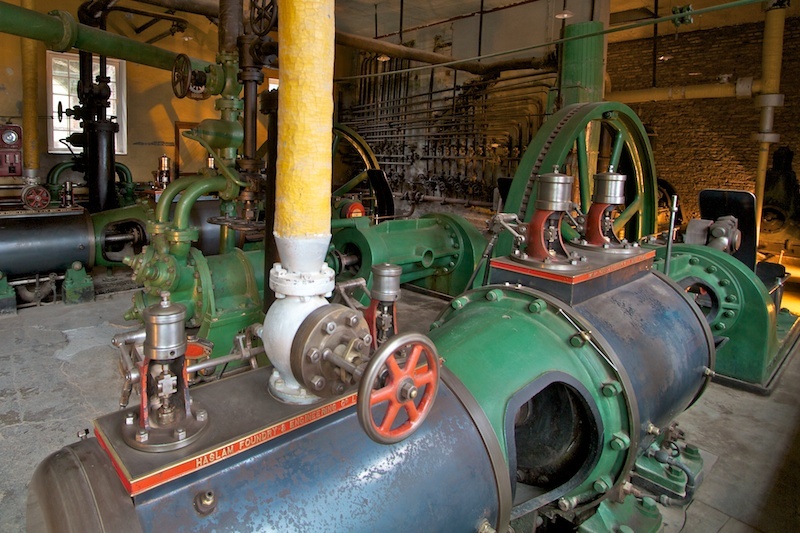 The Victorian engine room sits silent today at the end of the hall. 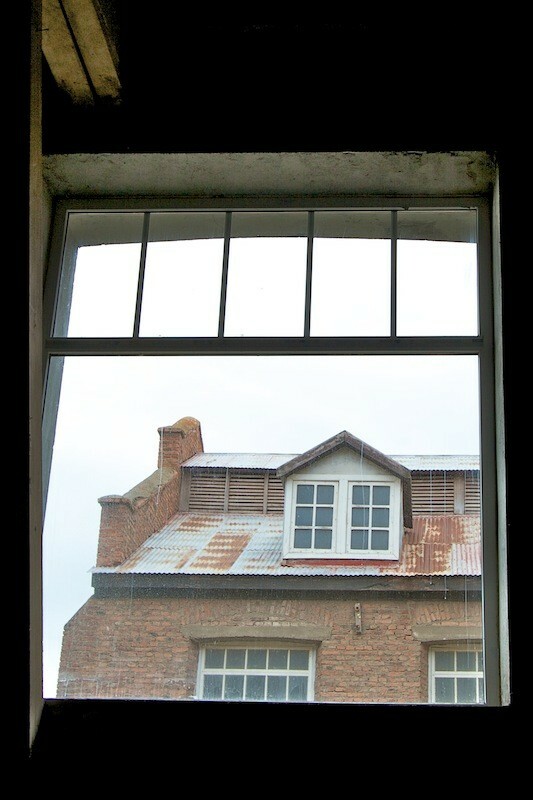 Windows along the hallway look out to the original plant office, engine maintenance and blacksmith shops. 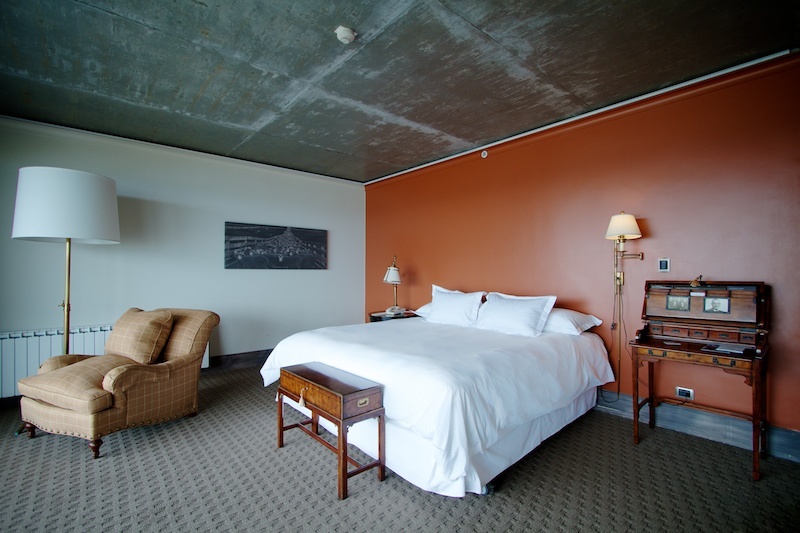 There are 54 rooms and 3 suites available to choose from. Keeping with the industrial look of the plant, the exterior of the rooms are clad in sheet metal and rivets. Ceilings are smooth cement. The front walls angle in from ceiling to floor and are lit top and bottom with accent lighting. 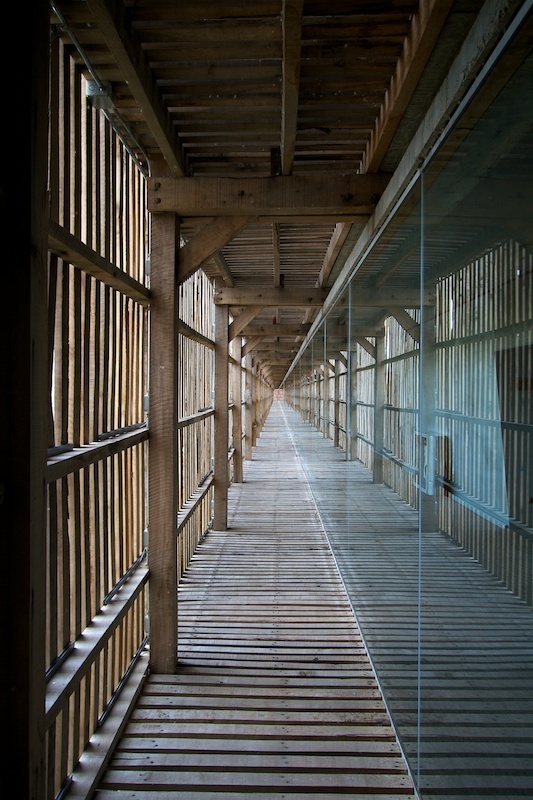 Glass walls encase the hallways and look out through slatted wood walls and floors to where the original weighing room once stood. 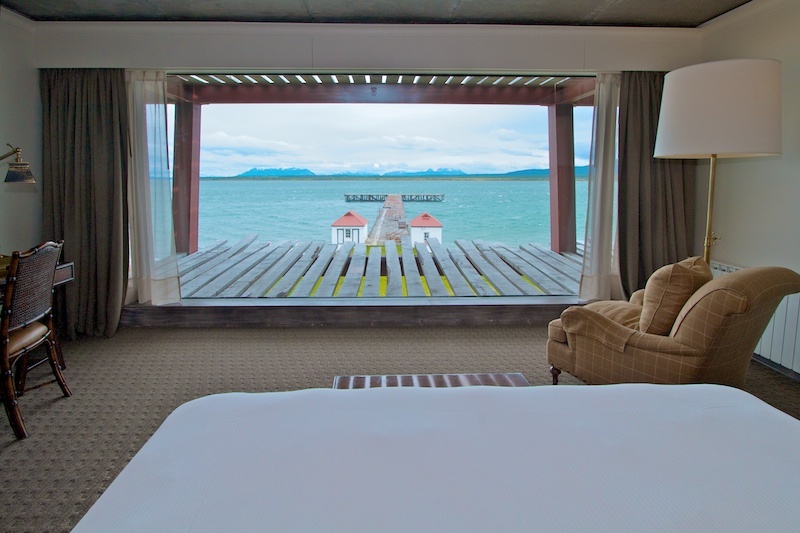 Each guest room has an amazing view of the Sound from its room wide floor-to-ceiling picture window. You can enjoy this view from an overstuffed chair, ornate wood desk or the king sized bed. The large floor and desk lamps are made of pipes coupled by brass valves and an industrial-sized sense of humor. 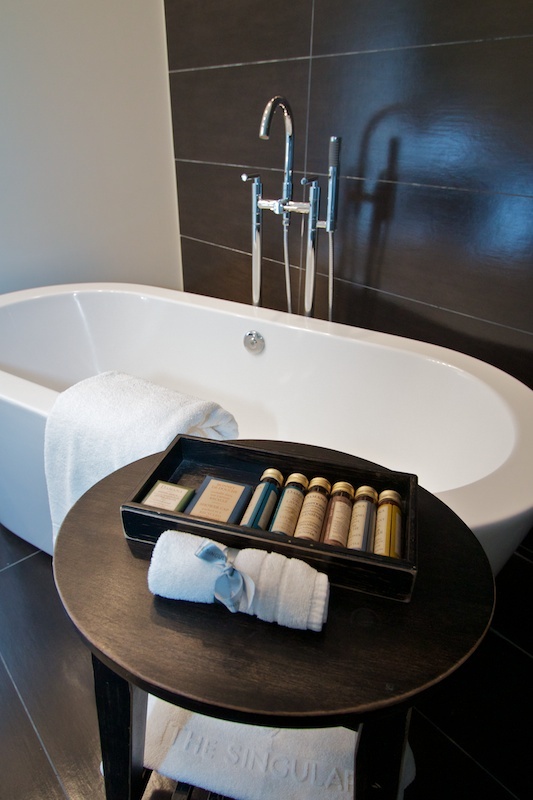 In the bathroom, a tub that can easily accommodate two sits next to the glass walk-in shower. A mini-bar is stocked with free water and sodas. Despite being located on the edge of a great Chilean wilderness, you’ll be able to sneak a peek at emails or send photos home via the free, fast Wi-Fi in your room and in the common areas. 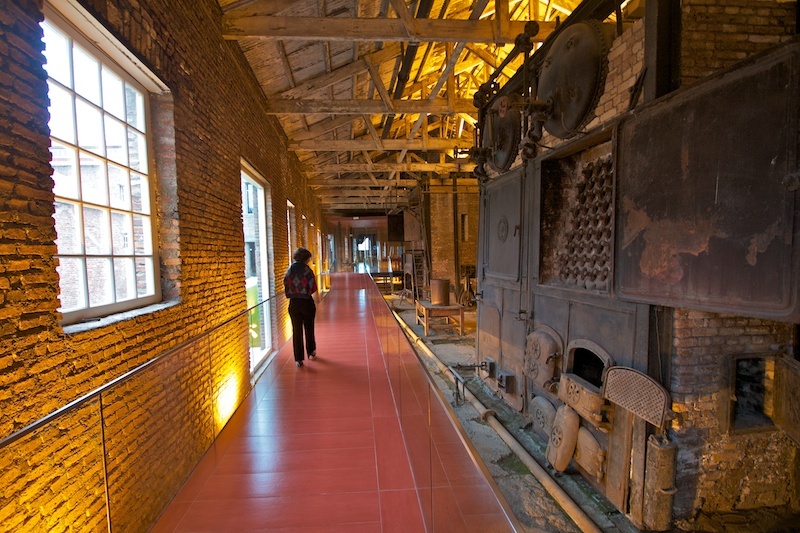 After getting settled, resume your exploration by returning back along the machine room hallway and past the front desk into a massive space that was once the tannery. A small but well stocked gift shop is at the start of a raised walkway. This space gives you some idea of the true scale of the plant. 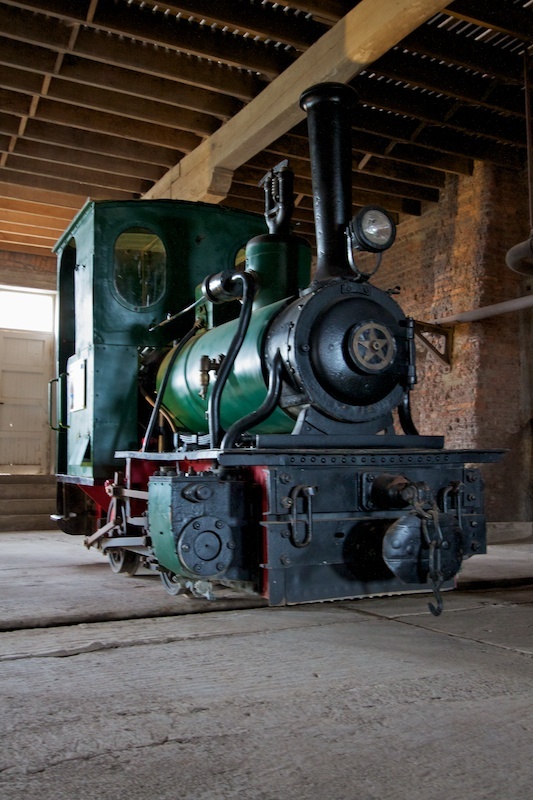 On display are carts, various bits of equipment and even one of the steam locomotives purchased in 1915 to load and unload ships. Continue along the walkway to the glass doors at the end. 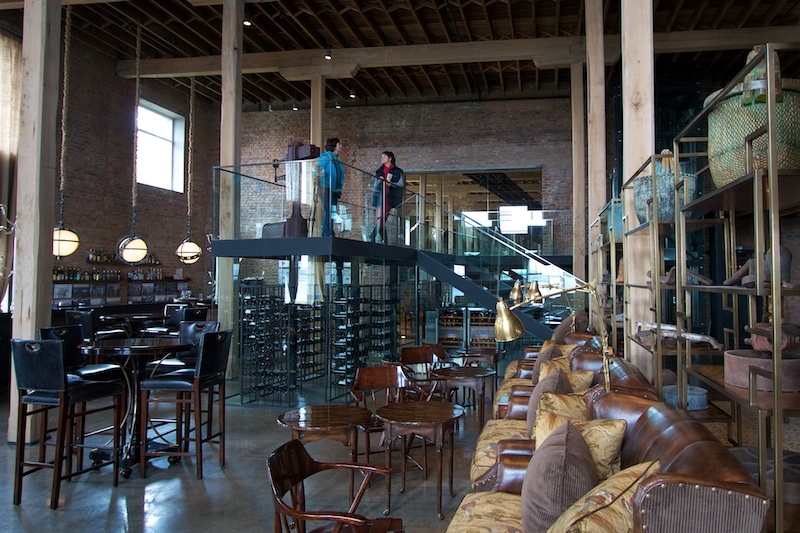 The original 3 floors of the tannery building now house the social epicenter of the hotel. 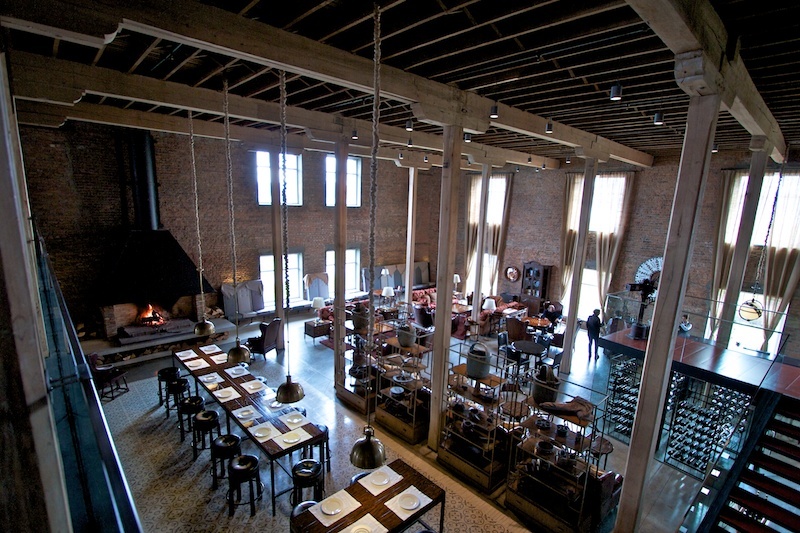 The bar and main restaurant reside on the first floor sharing a massive wood burning fireplace. Intimate sitting areas, with a mix of comfy couches and leather chairs, are scattered around the bar with its dark woods and shiny brass accents. 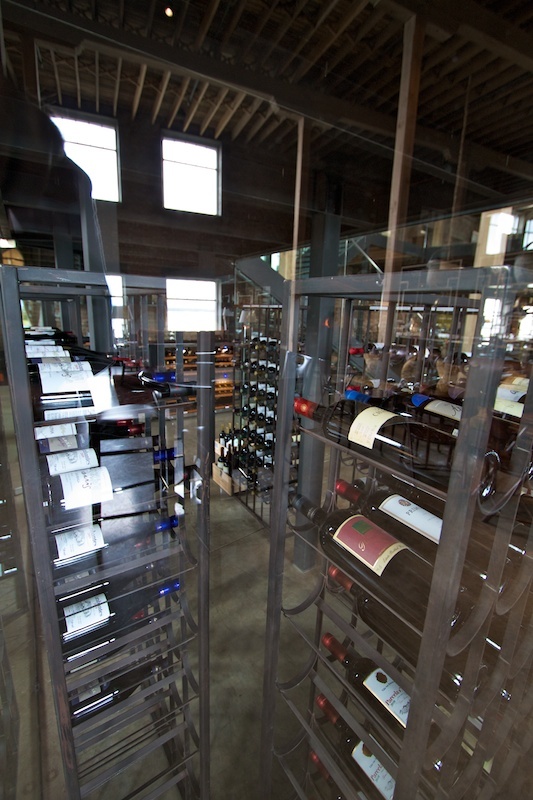 An impressive selection of wine representing each of Chile’s wine growing regions is encased in a glass wall “cellar” under the stairwell to tempt you on your way to the main dining area. Tables, large and small, share the dining room floor with more cozy seating areas framing low coffee tables. Set off on its own, between the bar and dining areas, is a massive table in front of the fireplace that seats up to 40 diners. 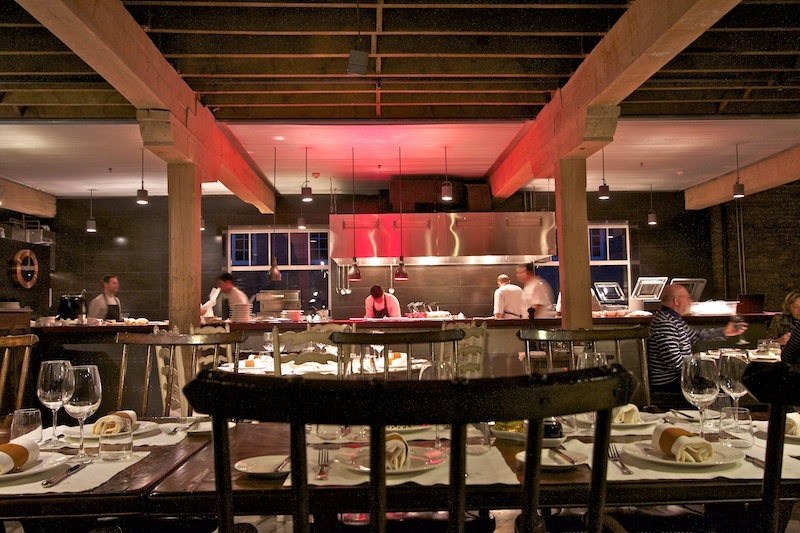 Your meal is prepared in full sight in the open kitchen and what a meal it is. The culinary team, lead by Chef Laurent Pasqualetto, has prepared a menu that is a delight with its large and creative selections and tempting specials. They will, as one expects with a five star dining experience, happily modify your choice to accommodate your dietary preferences or allergies. They even offer gluten-free bread. It would take a very extended stay to exhaust all of the epicurean options offered here but give the local meat specialties, such as guanaco or hare, serious consideration. They are both beyond excellent. 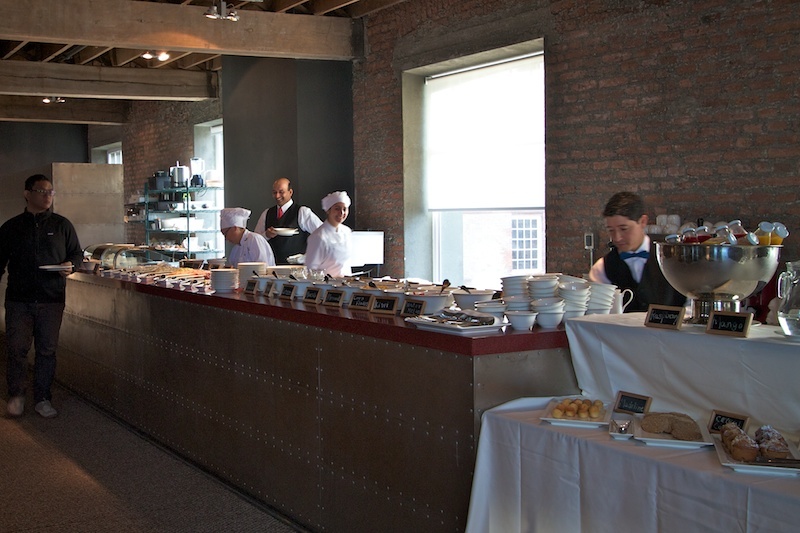 Breakfast and lunch are served in the second floor dining area. Breakfast has a buffet of fresh fruits, juices, cereals and cold cuts to start with while your made-to-order eggs are prepared. The lunch menu has a wide range of salads, sandwiches and smaller entrees. 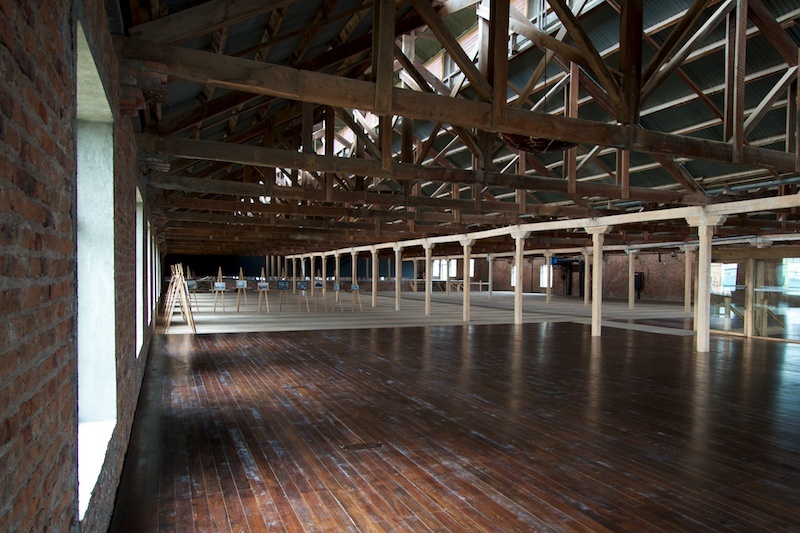 The top floor has been intentionally left wide-open and is available to be customized for hosting large events. Retreating back through the machine room hallway and past half of the first floor guest rooms are steps that lead down to a wide underground tunnel that takes you to glass enclosed hallway. 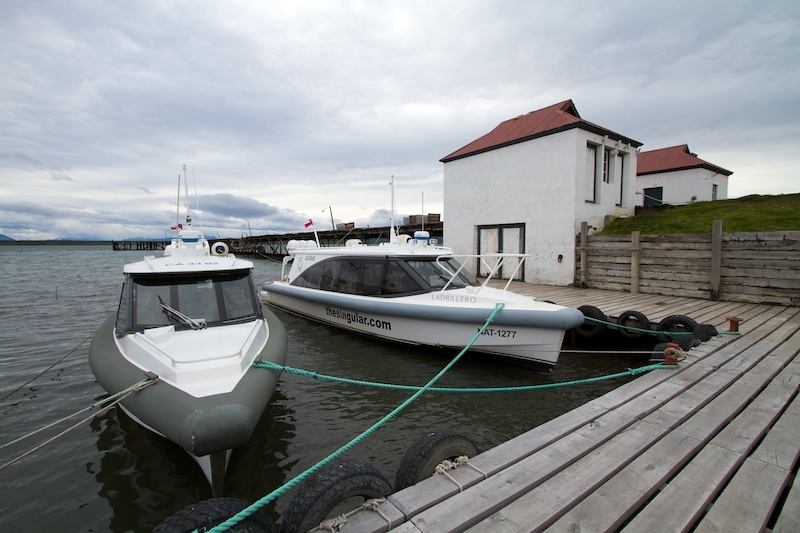 You can take the first exit to the historic pier and dock used by the hotel’s tour boats. Otherwise, continue to where the pool, sauna, steam room and spa can be found. You won’t train for an Olympic swim team in this petite indoor/outdoor heated pool but the view is amazing. 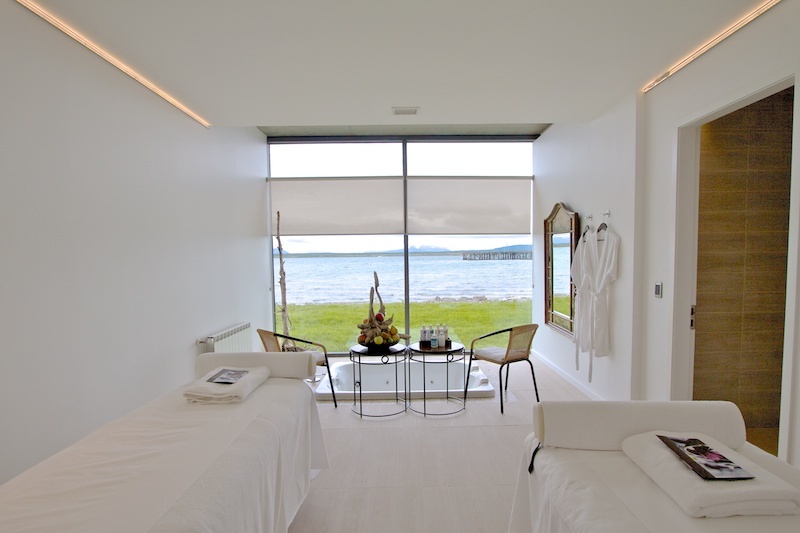 A full complement of spa services awaits you that can be scheduled individually or for couples. The excursion desk can help you select from dozens of varied activities. These range from easy adventures such as sailing, fly fishing, cycling or horseback riding to more exhilarating tours kayaking the sound or full day treks to Torres del Paine national park. 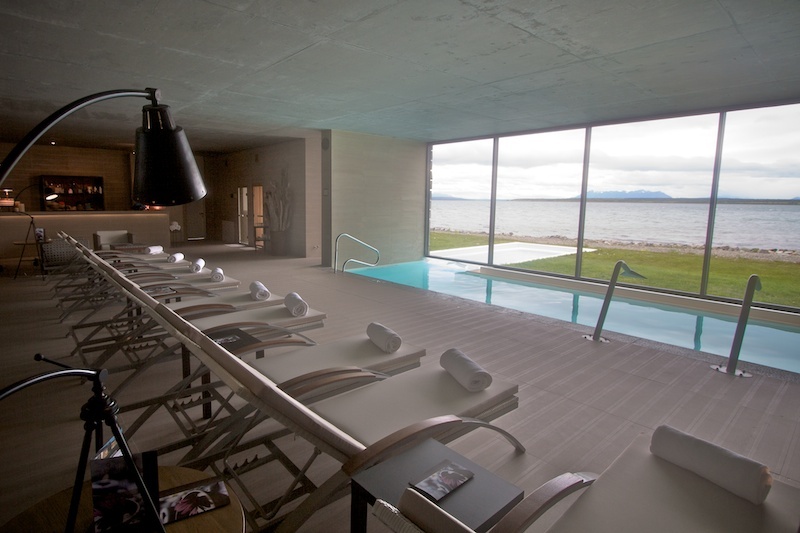 If you want to dedicate more time to the national park during your stay, you can move to Tierra Patagonia Hotel and Spa (“Luxury At The End Of The Earth”, LuxeBeat Magazine, December, 2013) for a few days and bookend your trip at the Singular Patagonia as we did. To get here, the port of entry for international air travelers is Chile’s capital city of Santiago. Located about half way down this long, thin country, it takes a bit over 3 hours to fly further south with LAN Chile to the Patagonian gateway city of Punta Arenas. A 3-hour drive brings you to Puerto Bories and the five-star Singular Patagonia. Recipient of numerous awards, such as the 2013 Trip Advisor Travelers Choice and Fodor’s New and Noteworthy in 2013, the hotel maintains a high staff to guest ratio and is dedicated to providing the best service possible. History, location and luxury merge into a quintessential experience unmatched anywhere. 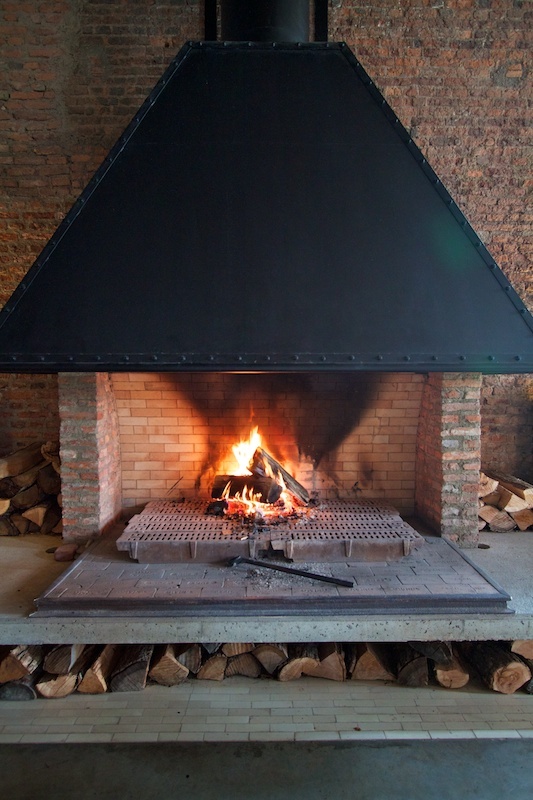 Travelers to this unique property celebrate Patagonia’s early industrial accomplishments in style. They leave with a desire to return again to be pampered within these walls and to explore this unique part of the world. You can find more information about this magnificent property at their website thesingular.com/patagonia/. To read the Luxe Beat Magazine version of this article click on the title A Singular Vision. Photography by David R. Beebe.